J.R. Meloy, The Psychology of Stalking.R. Saunders, The Legal Perspective on Stalking.K.K. Kienlen, Developmental and Social Antecedents of Stalking.M. Zona, R.E. Palarea, and J.C. Lane, Jr., Psychiatric Diagnosis and the Victim---Offender Typology of Stalking.G. 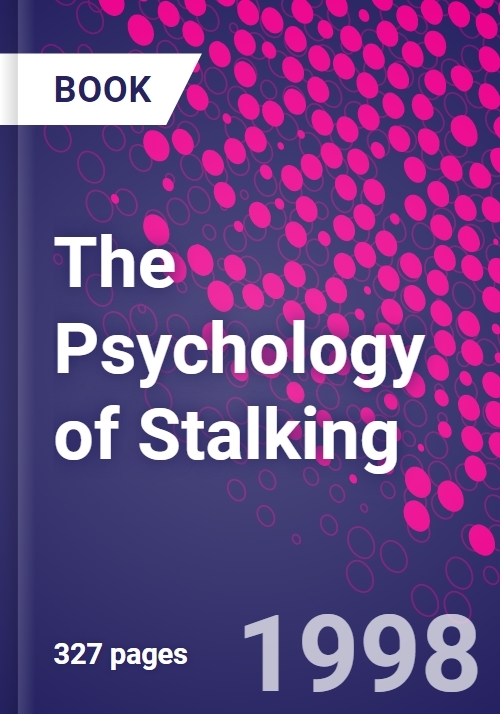 Skoler, The Archetypes and Psychodynamics of Stalking.D.M. Hall, The Victims of Stalking.L.E. Walker and J.R. Meloy, Stalking and Domestic Violence.J.R. Lion and J.A. Herschler, The Stalking of Clinicians by their Patients.R.A. Fein and B. Vossekuil, Preventing Attacks on Public Officials and Public Figures: A Secret Service Perspective.R. Lloyd-Goldstein, De Clérambault On--Line: A Survey of Erotomania and Stalking from the Old World to the World Wide Web.J. Meyers, Cultural Factors in Erotomania and Obsessional Following.K. Mohandie, C. Hatcher, and D. Raymond, False Victimization Syndromes in Stalking.G.S. Lipson and M.J. Mills, Stalking, Erotomania, and the Tarasoff Cases.D. Westrup, Applying Functional Analysis to Stalking Behavior.S.G. White and J.S. Cawood, Threat Management of Stalking Cases.